Use AppFollow Slack Bot to reply to customer reviews and monitor apps' data to promote your mobile app or game. To be able to send replies you need to integrate your app with App Store Connect and Google Play Console first. Otherwise your replies won't be published. 1. Get the bot after the integration setup via Slack app. If you use Webhook, use this guide to set up. 2. The bot will appear in your Slack channel, so that you can see it by typing `@appfollowbot` in the channel's message box. 3. Once the bot is in the channel, go to the AppFollow dashboard > Integrations > Slack Integration. 4. 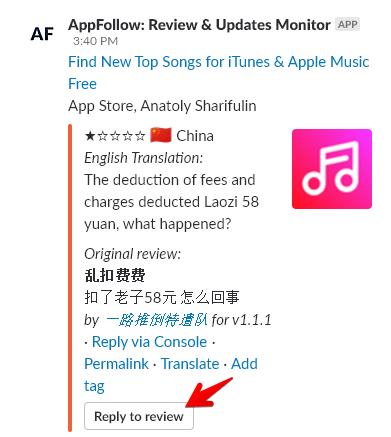 Click the three dots near the Slack Reviews integration and click "Edit integration" . 5. Mark the "Reply bot" checkbox and click "Save". 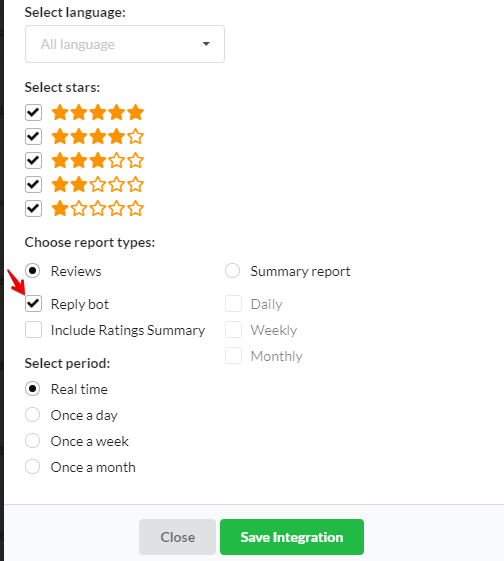 Now all reviews, that come to your Slack channel, will have a "Reply" button. Set up Slack integration to get more into your channel: featured apps, keywords positions, rankings, etc. 1. You can only add the bot to the public or private channels. Need help with settings? Just hit the chat button - we're here to help.